A change is as good as a rest they say. When that change also involves a change of environment for a few days, to somewhere more beautiful, diverse and rich, and to receive transformational coaching at the same time, coaching that will support you in awakening your deepest potential and confidence, there’s a power to it. Suddenly you’re getting more than a rest. You’re wide open for fresh ideas and new insights, you’re seeing yourself with new eyes in a new land, experiencing clarity and a complete change of mind. It might even feel scary to travel alone but it’s this very act of doing something completely new and totally for you, that excites the soul. By it’s very nature a retreat is asking you to put you first, to treat you. To withdraw from the noise of your usual world and go within, giving to Self (with a capital S) rather than to keep absorbing externally and keep giving to everyone else. In doing so you can expect to get back in touch with your wisdom and direction, to feel refuelled and with a greater sense of self-worth than before. I specifically invite you to Italy, away from your normal routine and environment, where you’ll now be distraction free and surrounded by the finest of beauty, so you can wake up inspired and access new ideas. This change lends itself to a change of mind, unlike a holiday it’s not just a pattern interrupt, rather through transformational coaching you experience a breaking up of all the habitual, insecure thought forms that keep you unfulfilled and stuck in the same cycle. The retreat with Grace has been a highlight of this year as a result of attending I’ve been able to take inspired action with much less overthinking. I’m now finally creating my own coaching programme and online course. 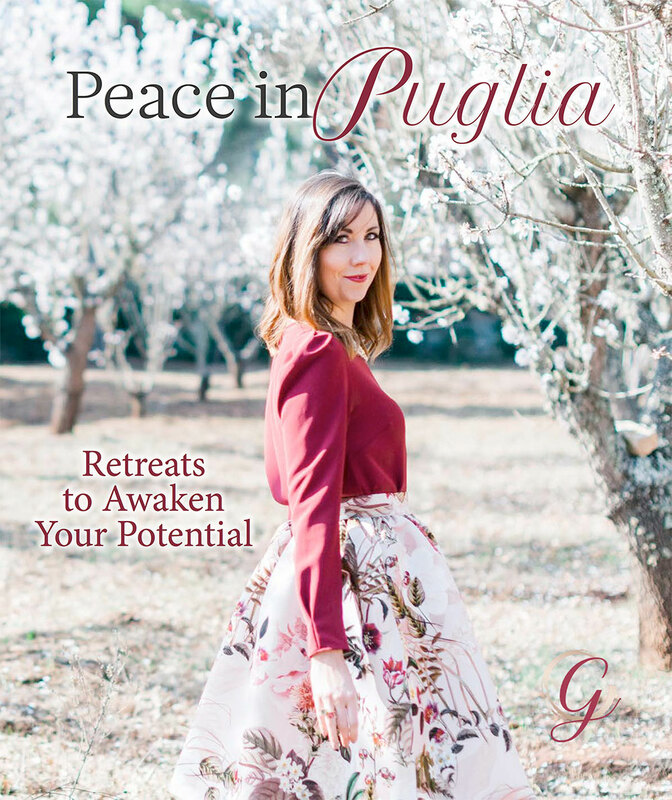 I wanted to spend time in beautiful Puglia and work with Grace on getting clarity on my business and other areas of my life. Grace has a beautiful way of not letting you get caught up in the stories and the ‘whys’ instead she is steadfast in guiding the conversation back to who you really are and the well being that is always with you. Grace looked after me the whole three days and we got to work and play while experiencing the beauty of Puglia and enjoy some delicious local food and wine. I often look back on my time with Grace and remember the simplicity and clarity I felt about my work and life. This is a retreat I intend to repeat each year. I got so lost in all the online stuff that I became very overwhelmed and disconnected from myself, then I found Grace and in our time together I feel I’ve come home to myself in a whole new way. I’ve experienced an innate confidence, clarity and grounded-ness that I never knew was possible . The majority of Grace’s previous clients have either gone on to leave their jobs and make a living with something they’re more passionate about. Or they’ve created more flow and income in an already existing business, adding more passion and style to how they serve clients. Grace supports you in getting back in touch with your own wisdom and true passions, and from that place you are clear and confident on what’s next for you. Grace helps you carry out next steps from there. Having been successful in her own business, creating multiple six-figures as a new coach and after leaving her 9-5 job as a school teacher, Grace also brings practical elements to her coaching that will support you in creating success without the overwhelm. We will meet for coaching, during this time we delve deep on what you need most help with. Through transformational coaching led by Grace and by exploring the principles behind every experience in life, you’ll begin to quiet the noise and awaken a deep clarity about your unique path and next steps. You’ll tap into the pure potential and wisdom within you so you finally have the confidence to act on what’s right for you. Where required Grace may also take you through her Passion Process, helping you get fully connected to what you’re truly passionate about so you can drop the guilt and low priority actions and instead live your life on purpose bringing more of what truly lights you up into your life, career and business. Evenings are for reconnecting with Grace, exploring what’s arisen in you, as we venture off to visit some stylish hotspots in the area. (See the places on offer on next page). We’ll enjoy a mix of adventures depending on your taste, from wine tasting, to olive oil sampling, to spa visits, shopping or tours in a classic Italian car. The aim here is that you do something new and have fun. An evening meal will be an epic experience where your senses are nourished with organic foods from the land and accompanied by the wine on offer that Puglia is so famous for. Grace is a breath of fresh air in the coaching world! Grace has guided me to reclaim my inner calm and wisdom so that I can my own success and happiness. under-motivated because I still wasn’t getting any clarity on my new business. Eventually the stress from the other program manifested in my body as a medical emergency! Days later, Grace called and invited me to join her retreat in Italy and she offered me an opportunity to give a fashion styling presentation. I listened to my heart and quickly acted upon my innate wisdom; I made my travel plans within 24 hours. I’ve always believed that my power as a woman is knowing that I am smart enough, resourceful enough, capable enough and dedicated enough to overcome circumstances that would stop me from becoming who I was meant to be. there was every reason in the world – despite my circumstances – that I needed to retreat. I trusted that Grace’s invitation would help me rise to my higher wisdom, open my eyes and transform me in ways I did not yet know. I had faith, I was willing, and I was open to indulge in my Self (as a woman and an entrepreneur), in my business and in the possibilities of whatever I was meant to learn in the process of this journey to be in retreat. The private luxury villa in the countryside of Puglia was exactly what the doctor should have ordered! Grace paced the days with mind, body and soul-filled activities for us to indulge in and she created “open spaces” for individual explorations with whatever was on our minds or in our hearts. Grace’s gentle inspirations, guiding insight and genuine caring nurtured the wisdom within me so that I could see my own solutions, know who I was meant to serve and how to do so in my own unique style! Despite my extreme hardships to get there, I walked away Confident in every aspect of my being with an extra (Italian) “inner-glow,” knowing with certainty my gifts of service that I have to offer to women and the world. I got a clear direction that felt perfect for me, the essence of my brand and how to bring all of my passions under one umbrella whilst still allowing me and my business to intuitively grow. I am forever grateful that I said “yes” to my Self and I highly recommend this unique and beautiful experience to work with Grace. What makes working with Grace so unique is her personalized approach that elicits clients’ own inner wisdom. I’ve flown from L.A to attend Grace’s live events and retreats, both have been an all-around delight where you feel yourself transformed not by effort but by the ease of being in Grace’s mentorship. You absorb change, almost by osmosis, and find yourself joyfully transformed as a result of it. Grace has helped me find peace of mind and direction concerning my career, I’ve gone on to leave my role as a professor at UCLA to finally start my own business doing something I love. Can you imagine a more fun, high style and nurturing way to break up old thought forms, get back in touch with your wisdom and awaken your true passions and potential? can you imagine waking up in Italy to the sound of church bells and the smell of freshly roasted coffee after sleeping well in the most luxurious space where everything is taken care of for you? You get to simply relax, be served, receive and rest in the quiet and wisdom that’s simmering within you. 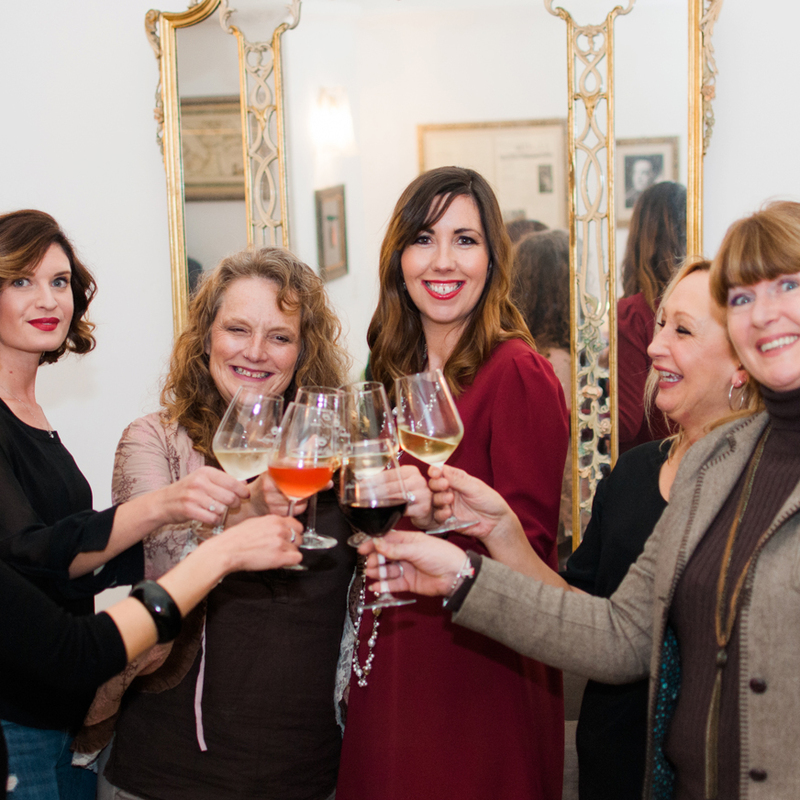 Can you imagine 3 fun and joyful days receiving transformational coaching that will change your mind and your life all whilst getting an insiders experience of Italy with Grace. Now imagine returning home no longer feeling stuck, tired, hopeless and overly responsible for others, instead awakened to your true potential, next level and the flow that’s available for you. This is the most graceful way I can support you, in an unrushed container of time where you finally have a chance to slow down, connect with what’s right and next for you and become fully in tune with your passions and wisdom. As a result of attending the retreat I’ve gone on to create the income and purchase the land to begin bringing my dream to life! I really enjoyed the retreat with Grace, I travelled from Florida for the first time to Puglia. What I loved was the sense of peace and clarity I gained by being in the space with Grace and the other women. I also loved how much time and access I had with Grace as my coach, nothing was rushed and it was like I could ask anything and everything, as ideas came to me across the 3 days. The hospitality and luxury lifestyle elements alongside the coaching made this a unique experience. As a result of attending the retreat I got clear on my desire to build a home in the Caribbean and I’ve since gone on to create the income and purchase the land to begin bringing this dream to life! A private retreat with Grace is definitely an investment worth gifting yourself! After doing some online work with Grace, I wanted to have my own “personal container” and do a “deep dive” into my plans for moving forward; and to think it could be in one of my favourite countries Italy, omg, sign me up. Like always I got more than expected as I spent time “hearing more from myself & less from the world”. My retreat helped clarify my direction and next step. I tapped into my wisdom, which whispered “Sabbatical “ this was supposed to remain my focus. I had been turning in the direction of the worlds “next thing” for me when my best service to the world right now was showing up on “sabbatical” in honor of my own self-care and being a radiant example that it is ok to take care of yourself. Loving living this retreat result today. Hope you too get the chance to “hear more from You” on retreat with Grace in Italy! My business is flourishing the retreat was my best investment! It was a stylish retreat! However it was not only about my stylish surroundings. Through Grace’s intuitive coaching I had some ‘aha’ moments during the retreat and in the days that followed. The retreat gave me space to think, inquire and to just be. As a result, my confidence has increased and it has started a transformational process. I have launched my first podcast; Her Career Confidence- for busy women with big ambition, interviewing influential women about their challenges and success. My business is flourishing as I have secured £20,000 in contracts already, and it’s only the beginning of the year. I’m also training to run 5K this year as I take on a new fitness challenge. The retreat was my best investment because I have created amazing results since attending and I know that there is more to come. Attending the Stylish Business Retreat in Italy with Grace was truly magical and exactly what I needed for me to anchor in my desires and focus on what was most important for me and my business. The retreat was a perfect blend of self care, adventure, and business support. Since the retreat, I have manifested 10days in the Amalfi coast staying at luxury locations, selling a $5k package, hosted a high end client in New York city, and have an overall deeper connection with myself that has created a sense of peace that has me clearer and focused for the new year ahead with intentions to live in a new apartment, spend the summer months in Italy, travel to Dubai and host my signature design your life retreats.